There are books you read, enjoy and forget, and there are books, whose stories stay with you long after you have read them. 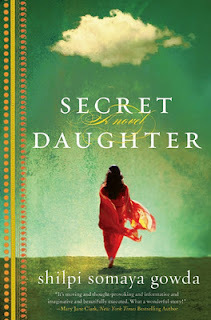 Secret Daughter by Shilpi Somaya Gowda falls in the latter category. The novel takes you through the lives of two women one in India and the other in America each of them linked by a girl child. The story is such that it lingers in your mind long after you have read it. It made me realize for the umpteenth time that I am so lucky to be have been raised by parents who have always thought of my well being. This is a story I would recommend all my lady friends to read;well researched, well written, heart touching, absorbing and a compelling read. Somer's life is everything she imagined it would be--she's newly married and has started her career as a physician in San Francisco--until she makes the devastating discovery she never will be able to have children. The same year in India, a poor mother makes the heartbreaking choice to save her newborn daughter's life by giving her away. It is a decision that will haunt Kavita for the rest of her life, and cause a ripple effect that travels across the world and back again. Asha, adopted out of a Mumbai orphanage, is the child that binds the destinies of these two women. We follow both families, invisibly connected until Asha's journey of self-discovery leads her back to India. This novel was an emotional roller coaster ride. It got me hooked right from the beginning. The author has studied the problem of female infanticide in India deeply and thoroughly and that is evident from the way the problem is portrayed throughout the novel. Kavita’s first child is a girl. Before Kavita could comprehend what was happening, her daughter is brutally separated from her by her husband, Jasu. So, the second time Kavita gives birth to a girl child, she gives her away to an orphanage to save her daughter’s life. It is the fierce desire of a mother to save and protect her child that compels Kavita to take such a drastic step. In many rural poor families in India a girl child is still considered a burden, an extra mouth to feed which gives no returns- rather one who has to be sent away to another house one day with a handsome dowry. On one hand, Kavita bears the separation from her daughter; there is Somer in America who is anguished and suffering as she cannot have a baby of her own. Both women are different in every aspect, but are linked by destiny because of Asha. The author has sketched the characters of both of them very intricately. The beauty of the novel is as you read the novel; you could feel their emotional turbulence, their sorrow and their joy. The novel is not all negative, amidst all details of female infanticide, dowry problems, poverty and illiteracy; you could see a ray of hope. India is a land of contradiction and that is beautifully described through the eyes of Asha when she makes her first India visit. From opulent marriages, bright colours, gorgeous dresses, family bonding, Indian festivals to life in Dharvi, the largest urban in South Asia, Asha’s visit to India takes her through all and with her, the readers witnesses the startling contradictions in the Indian society. But that is not what the story is about. These things are in the backdrop while the main plot of the story is about Kavita, Somer and Asha. Interweaving the stories of Kavita, Somer, and the Asha that binds both of their destinies, "Secret Daughter" poignantly explores the emotional terrain of motherhood, loss, identity, and love, as witnessed through the lives of two families--one Indian, one American--and the child that indelibly connects them. Thanks for the recommendation, having read your review I have now added this title to my wishlist. I loved this book too. I can't wait until the author writes another!